Week #3 was the journey week. This time the students made their way around the small lake near Cofradia and participated in a number of different water activities. Everyone got soaked and everyone had a great time! They all walked back to the church for the "Refuge" time of worship and the Word, then voting again for yet another team to do chores. EL RETO SEMANA #3 from macx on Vimeo. If you have access to Facebook, you can view all the photos of the Week #3 photo album here. You can make a difference in a young person's life! Week #2 has come and gone. After taking role call and sharing some announcements, the students made their way outside the church property for the game of "Gladiators." This is very similar to the show American Gladiators where they shoot tennis balls at people as they try to make it through an obstacle course. We don't use tennis balls, we use water balloons and it is always a huge hit each year; this year, we changed it a little. 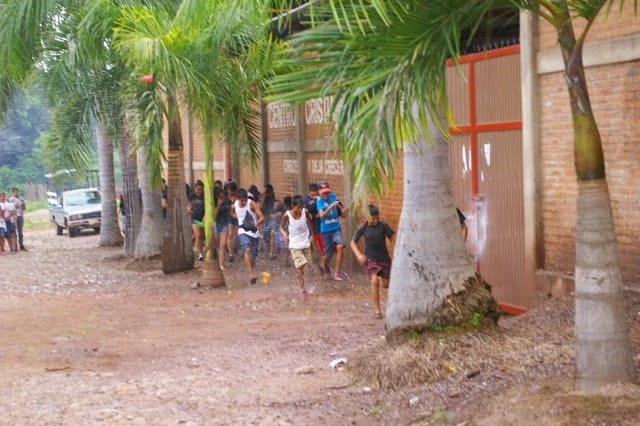 Instead of setting up an obstacle course at the soccer court in Arrayanes, we had them run along side the church building using the palm trees as their protection. This game shows a picture of how we need to be careful of the hurtful words that come our way. Many of us have experienced "bullying" at one time in our life, especially for being a Christian-that was one of the biggest struggles for me growing up in school…Public and Christian. We have a choice. Are we going to let those hurtful words mold us and detain the growth of our relationship with Christ? Are we going to get offended and fight back? Or, are we going to forgive even though we've been "hit" by a "balloon"? I think Christ showed the ultimate example as people mocked him before they crucified him to a "short-lived" death. He forgave them. He was obedient to His Father. And, He is no longer dead, but rose again on the third day. In THAT is where our Faith as Christians gives us Hope. The second activity was another big hit that we do each year…The Banquet! This shows that we need to do things we won't like to in our lifetime. We always tell the students they don't have to eat it, but they do it anyway for their team! 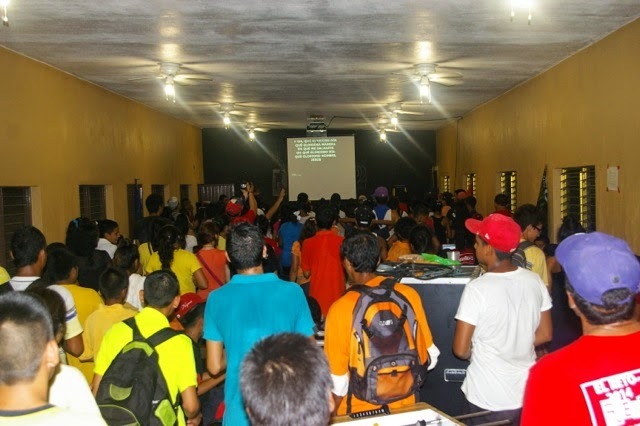 We finished up the day with our hang-out time in "The Refuge", worship, a message from Pastor Luis, and then the teams voted for another team to do chores. If you have access to Facebook, you can view all the photos of the Week #2 photo album here. semana#2 from macx on Vimeo. EL RETO / THE CHALLENGE has begun in Cofradia. 148 young people gathered together from 11 different cities and towns from throughout this part of the state. This first week of the 6 week event focuses on forming team identities through working together in various different activities and games. Each team has a name chosen from a story in the Bible that has to do with Respect: The Servants of the Lord, The Obedient Servants, The Over-comers, The Humble Ones, The Indestructible Ones, and The Triumphant Ones. This year, the students are learning to show respect to one another and themselves as we confront the issue of bullying. Pastor Luis shared an excellent message using the acrostic "RETO". R-Respect; E-Integrity (The spanish word was "Entereza"); T-Tolerance; O-Obedience. In the end, many shouted out for Jesus to take hold of their lives!